Each week we share insights, analysis, and opinions of the week’s transactions. To see previous posts, click here and start working back. Jets (signed DT Trevor Pryce, cut DT Howard Green) – We discussed the Pryce move in this post. To make room for him, the Jets cut Green, whom they signed after Kris Jenkins’ injury. Ravens (cut Pryce, re-sign S Ken Hamlin) – We discussed the price of Pryce (and Hamlin) in this post. Jaguars (claimed QB Trent Edwards) – The Jaguars, who lost Luke McCown to injury earlier this year, claimed Edwards off waivers after Buffalo released him. Edwards immediately becomes the most solid backup option Jacksonville has, and if David Garrard continues to struggle, Edwards could get a few starts to see if he fits in Jax. Bills (sign QB Levi Brown) – After cutting Edwards, the Bills brought back Brown, their seventh-round pick out of Troy this season. He’ll become the No. 3 quarterback behind Ryan Fitzpatrick and Brian Brohm. 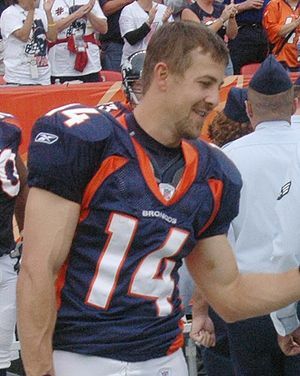 Seahawks (add WR Brandon Stokley, cut RB Quinton Ganther and OG Chester Pitts) – Stokley (pictured), who played for the Broncos last year, can fill in as a slot-type receiver. The Seahawks are playing a bunch of wideouts now but haven’t developed consistently reliable options, so Stokely could help. Patriots (add RB Thomas Clayton, cut OG Quinn Ojinnaka) – With Fred Taylor hurting, Kevin Faulk out for the year, and Laurence Maroney in Denver, the Pats added RB depth with Clayton. They cut Ojinnaka, whom they acquired in a training-camp trade with the Falcons. Texans (add CB Karl Paymah) – Paymah, who has bounced around to Minnesota and Denver in recent years, is a speedy and kind of tall corner who isn’t great but is good enough to be a No. 4. He adds depth to one of Houston’s big problem areas. Colts (add LB Tyjuan Hagler, cut TE Gijon Robinson) – Hagler returns to Indy to help fill in after injuries to Clint Session and Kavell Connor. Saints (add PK John Carney) – With Garrett Hartley struggling in two of three games this year, the Saints brought back Carney, who is 46 but should be reliable from 40 yards and in. They kept Hartley, who still has a chance to develop as a top-flight NFL kicker, but it’s clear they don’t have confidence in him right now. Lions (add CB Dante Wesley, cut S Randy Phillips) – Detroit brought back Wesley, a cornerback who’s a big asset on special teams. Panthers (add C Chris Morris, cut DT Louis Leonard) – The Panthers cut Leonard, whom they traded for last year, in part because he had been passed by Nick Hayden and Derek Landri. His roster spot went to Morris, who adds depth to an offensive line that had little. As we continue our coverage of free agency, we’ll compare signings from March using Football Relativity. This post includes signings beginning March 11; for signings from the first week of free agency, check out this elongated post. 10 – Jets (added RB LaDainian Tomlinson, S Brodney Pool, and LB Lance Laury; kept FB Tony Richardson) – Tomlinson had a great career in San Diego, but he showed serious signs of slowing down in recent years, with his yards-per-carry average dropping to 3.3 in ’09. So the Chargers eventually had little choice but to release him and move on. With the Jets, Tomlinson should know that he’s taking a subservient role to emerging youngster Shonn Greene, and with Leon Washington returning from an ACL injury, Tomlinson could find carries hard to come by. The positive of that is that Tomlinson will stay fresher, but he’ll have to show a little more patience than he did in San Diego. If Tomlinson knows what he’s signing up for and is willing to be a 10-touch-a-game back, he could help because he provides more contrast to Greene than the departed Thomas Jones would have given. If not, Tomlinson will fade away in a strange-looking uniform, and the two-year, $5.1 million deal the Jets gave him will be wasted. Unfortunately, our hunch points toward the latter scenario. Meanwhile, Pool is a promising player who wasn’t tendered as a restricted free agent in Cleveland. He’ll get $1.3 million in a one-year deal with the Jets, where he’ll have a chance to replace the traded Kerry Rhodes in the starting lineup. Richardson is a solid blocking fullback who knows his role and plays it well. Laury, who was not tendered by the Seahawks, is a backup linebacker and special-teams ace. 10 (con’t) – Cardinals (added OLB Joey Porter, QB Derek Anderson, UFA OG Rex Hadnot and UFA LB Paris Lenon; kept UFA OT Jeremy Bridges, UFA LB Monty Biesel, and C Ben Claxton) – Porter, who was released by the Dolphins, is still a quality pass rusher who can make an impact in a 3-4 defense. At age 33, Porter has a lot of miles on his tires, but with 26.5 sacks in the last two years he hasn’t shown signs of major slippage. He helps to replace Bertrand Berry, who said he is retiring, for an Arizona defense that needs playmakers badly after losing Karlos Dansby and Antrel Rolle in the offseason. Porter isn’t the athlete the departed are, but he can help. While $17.5 million over three years (with a potential $7 million more in incentives) seems rich for a 33-year-old, Arizona was in a spot where it needed a defensive jolt. Porter can still provide that. Anderson, who had one good year out of four in Cleveland, got a two-year, $7.25 million contract in Arizona to back up or even challenge Matt Leinart. Anderson is not consistent, but he has a strong arm, and he’s fearless enought to go for the big play. That has too often led to interceptions, but in the run-first, big-play offense Arizona is moving toward, he could actually be a fit. The fact that Arizona has such a talented corps of receivers makes Anderson a better chance. At the least, he’ll challenge Leinart and force the former first-rounder to step up in order to seize the starting job, and if Anderson does that he’ll be worth the freight the Cards are paying. Hadnot got a three-year, $9 million deal to move over from Cleveland. He’s a physical guard who can also play center and figures to become a starter for Arizona. Bridges, who started several games last year, is a talented tackle who has gotten into trouble off the field. Lenon started for the Rams last year and now moves over to provide a veteran to help fill the gaping hole left by Karlos Dansby. Biesel provides depth but will help more on special teams. 8 – Bills (added UFA DE Dwan Edwards and ILB Andra Davis; kept UFA TE Joe Klopfenstein) – As they move to a 3-4 defense, the Bills brought in reinforcements. Davis had a pretty good year as an inside ‘backer for Denver last year and was a nice addition on a two-year deal. Edwards, who got a four-year, $18 million deal to move over from the Ravens, is a sturdy end who can shine in the 3-4. Both are quality additions for a team that desperately needs them. 7 – Browns (added UFA TE Benjamin Watson and QB Jake Delhomme; kept UFA OL Billy Yates) – Watson was an inconsistent talent in New England, but he had some production, and he’s a better tight end than what the Browns had. Tight end is a crucial receiver in the West Coast offense, which is what Cleveland is moving toward, and so making an addition at that position is sensible. Watson got a three-year deal worth $12 million with $6.35 million guaranteed. Delhomme got $7 million over two years while still getting $19 million guaranteed from the Panthers deal he was released from. Delhomme is a terrific locker-room leader, and he has shown a knack for performing well under pressure earlier in his career. But his interception and fumble problems have been stark since his meltdown in a playoff game against Arizona in the 2008 season, and at this point it’s hard to see him breaking that year-long trend soon. Still, Delhomme may be a better answer than Seneca Wallace, who doesn’t have the pedigree of performance Delhomme has over his career. The Browns are getting a little bit of a discount on Delhomme because of his sweetheart Carolina deal, and at those numbers he’s worth a shot. We just don’t expect that shot to come in. Yates is a backup lineman who helps add depth now that Rex Hadnot and Hank Fraley are gone. 6 – Redskins (added UFA RB Larry Johnson, UFA QB Rex Grossman, P Josh Bidwill, and CB Philip Buchanon) – Johnson was released in Kansas City midseason last year as his production waned and his complaints persisted. Johnson landed in Cincinnati as a backup to Cedric Benson, and he looked a little better, averaging 4.4 yards per carry in Cincy versus 2.9 in K.C. Now Johnson moves to Washington, where he will either work with Clinton Portis or replace him, depending on what the ‘Skins decide to do with their incumbent veteran back. Since Portis’ contract is basically guaranteed, we figure he’ll be back. That’s just as well, because Johnson is no longer a starting-caliber NFL back. He’s better in the role he had in Cincinnati at the end of last year, and spot duty will allow him to keep the limited pop he has left in his legs. The three-year, $3.5 million deal Johnson got indicates that’s the role he’ll have – but the potential of making up to $12 million in incentives indicates that more malcontent behavior could be in the offing if Johnson doesn’t get the ball as much as he wants. Grossman, a former Bears starter, was solid as a Texans backup last year and now moves with ex-Houston offensive coordinator Kyle Shanahan to Washington. Chances are that Grossman, who got a one-year deal, will back up Jason Campbell. Bidwill was released by the Buccaneers in a cost-saving move after missing the ’09 season, but if healthy he is solid. Incumbent Hunter the Punter Smith is a free-agent, so the Redskins need a fallback option. Buchanon got a one-year, $1.5 million deal to provide help at corner. Buchanon’s a marginal starter but he’s worth that price for depth purposes if nothing else. 4 – Chiefs (added OG Ryan Lilja; kept C Casey Wiegmann) – Wiegmann made a Pro Bowl with the Chiefs two years ago and now returns after being cut earlier this offseason. His veteran wiles help a young offensive line. Lilja, who started for the Colts over the past few years before being released this offseason, got a three-year, $7.5 million deal to come to K.C. and help to stabilize the offensive line as well. He’s not an elite guard, but Lilja will be a big upgrade for a Chiefs team that needs solid starters up front. 3 – Packers (kept UFA OT Mark Tauscher, franchise NT Ryan Pickett, and RFA S Nick Collins; added P Chris Bryan) – The Packers rarely get too involved in the free-agent market, instead preferring to develop through the draft. So it’s no surprise that their big strategy has been to re-sign their players. Tauscher, who the Packers brought back at midseason last year to help a horrible offensive line, got a two-year deal to remain at right tackle. He’s a veteran who provides stability until T.J. Lang is ready to seize a starting job. Pickett, the Pack’s franchise player, went from a $7 million tender to a four-year, $28 million deal. He’s done a great job for the Pack after bombing as a first-rounder in St. Louis, and he became even more valuable when he moved to the nose when Green Bay implemented the 3-4 defense last year. Collins, who had been angling for a new contract for two years, got a four-year, $23.4 million deal. He’s a playmaking safety who really adds to the Packers’ defense. Bryan is an Australian Rules Football player whom the Pack hopes can become a solid NFL punter a la Sav Rocca, Mat McBriar, or Darren Bennett. That strategy has actually been pretty successful for NFL teams. 3 (con’t) – Rams (added C Hank Fraley, CB Kevin Dockery, and TE Darcy Johnson; kept LS Chris Massey) – Fraley, who was released by the Browns, isn’t physically gifted, but he’s a rugged center who can help an offensive line that really struggled last year. Dockery and Johnson are former Giants who know now-Rams head coach Steve Spagnuolo from days in the Meadowlands. Neither is more than a role player, but they could help a roster bereft of talent. Massey got a four-year deal for being a dependable long snapper. 3 (con’t) – Steelers (added UFA ILB Larry Foote; kept UFA QB Charlie Batch) – Foote was a long-time Steeler who was cut before last season and went to Detroit, where he played well. Now he returns to Pittsburgh on a decent deal that’s worth $3.9 million in year one and potentially worth $9.3 million over three years. He should return to the starting lineup for Pittsburgh. Batch provides stability at quarterback, which is vital given Ben Roethlisberger’s legal problems and Dennis Dixon’s inexperience. 2 – Titans (kept UFA CB Rod Hood; added UFA DE Jason Babin and CB Tye Hill) – Hood started for the Cardinals in the Super Bowl two years ago and then went on an odyssey through Cleveland and Chicago before he found a home in Tennessee at midseason. The Titans brought him back because he fit their defense and can provide depth at a position that has been troublesome for them. Babin was an unrestricted free agent who had given the Eagles right to match any contract offer he got, but Philly opted to let Babin leave on a one-year, $1 million deal. Babin has never realized his potential as a first-round pass-rusher, but Tennessee’s defensive line coach Jim Washburn is one of the best, which makes taking a shot on a talented player reasonable, especially at the price Tennessee is paying. Hill, a bust with the Rams, never found a role with the Falcons last year and was released. But he’s fast, and given the Titans’ struggles last year in the secondary he’s worth a shot to see if he can help. 2 (con’t) – Patriots (added UFA TE Alge Crumpler) – After cutting Chris Baker and letting Ben Watson leave via free agency, the Patriots had no experience at tight end. They now have some in Crumpler, who proved in Tennessee that he is no longer the receiving threat he was in Atlanta. But Crumpler is big, and he’s a good blocker, which could make him a fit in the Patriots’ offense. New England should still look for a young tight end, but Crumpler will fit in at least some sets. 2 (con’t) – Dolphins (added C Richie Incognito) – Incognito is a talent who is tempermental on the field and off, and that act wore thin on the Rams, who cut him. But his talent, physical play, and aggressiveness merits a second chance if he can get with the program in Miami. He’s good enough to start if everything falls in line. 1 – Seahawks (added UFA TE Chris Baker, UFA WR Sean Morey, LB Matt McCoy, WR Ruvell Martin, and RB Quinton Ganther) – Baker is a versatile tight end who isn’t great but who fits well as a backup to John Carlson for the Seahawks. Baker got a two-year, $4.75 million deal. Morey is a special-teams dynamo who will make a big difference in that area moving over from Arizona. McCoy played for new Seahawks defensive coordinator Gus Bradley in Tampa Bay the last two seasons. Martin and Ganther were non-tendered as restricted free agents by the Rams and Redskins, respectively. 1 (con’t) – Buccaneers (added UFA S Sean Jones and LB Jon Alston; kept UFA LB Angelo Crowell and WR Mark Bradley) – Jones was once a great prospect for the Browns, but he left Cleveland and then spent one mediocre year in Philly. Jones has talent to help the Bucs at a problem position, but it remains to be seen whether he’ll actually live up to the promise. Still, he’s worth a look for a Bucs team that needs a ton of help. Alston was not tendered by the Raiders in the offseason despite starting eight games over the past two years. He adds depth to the Bucs’ linebacking corps. Crowell missed last season with an injury, but if he can return to his Buffalo form, he could help the Bucs. Bradley showed some potential in Kansas City, and that led the Bucs to bring him back even though he wasn’t tendered a restricted free-agent offer. 1 (con’t) – Vikings (kept UFA DT Jimmy Kennedy) – Kennedy, like Ryan Pickett a former Rams first-round bust, found a home as the third defensive tackle in Minnesota, and he opted for a two-year, $6 million contract to stay with the Vikings. He’s a key player for the Vikes who may be even more key if the StarCaps case goes against starting DTs Kevin and Pat Williams. 1 (con’t) – Panthers (kept UFA DE Tyler Brayton and OT Rob Pettiti; added CB Marcus Hudson) – Brayton, a former Raider first-round pick, became a sturdy run-stopping end for the Panthers, and they brought him back on a three-year deal to add experience to a defensive line that averaged 23.8 years of age before he was re-signed, according to Darin Gantt. Brayton doesn’t produce a huge pass rush, but he is a legitimate presence who keeps opponents from cheating in their blocking assignments. The Panthers didn’t tender Pettiti, whom they signed out of the UFL, as a restricted free agent, but they brought him back anyway. They signed Hudson, who was not tendered by the 49ers, to add depth at corner. 1 (con’t) – 49ers (added UFA CB Karl Paymah; kept UFA OT Barry Sims) – Sims is a good swing tackle who’s acceptable as a starter in a pinch, and that made him worth $2.1 million in 2010 to the Niners. Paymah is a fourth corner who can plug into the third spot in a pinch. He has good size, but his cover skills are spotty. 1 (con’t) – Bengals (kept UFA S Roy Williams; added WR Chris Davis) – Williams started for the Bengals last year before an injury sidelined him. He no longer has great range or coverage skills, but he’s still an asset against the run. 1 (con’t) – Colts (added OT Adam Terry) – The Colts, who added OG Andy Alleman previously, brought in Terry to continue the project of adding size to their offensive line. Terry, a five-year veteran who was not tendered a contract by the Ravens, missed the ’09 season with injury. He’s more of a third tackle who can fill in on both sides than a starting candidate, but he’ll help provide depth. 1 (con’t) – Eagles (added WRs Hank Baskett and Chad Hall) – Baskett (aka Mr. Kendra) comes back to Philly after a year in Indy marred by his gaffe on the onsides kick in the Super Bowl that proved devastating for the Colts. He’s a big receiver who won’t play much on offense but could help on special teams. Hall, a former Air Force player, is eligible to play now after completing his service requirement. He could end up being an under-the-radar prospect. 1 (con’t)- Lions (added LB Landon Johnson; kept DE Copeland Bryan and UFA S Marquand Manuel) – Manuel and Bryan (who was non-tendered as a restricted free agent) are depth players for Detroit. Johnson was released as a backup in Carolina, but he’s versatile and can provide depth at all three linebacker positions. 1 (con’t) – Bears (added CB Tim Jennings) – Jennings, a former second-round pick, never became a rotation corner in Indianapolis, and he wasn’t tendered a restricted-free-agent offer. But he could find a role as a third or fourth corner in the Bears’ cover-2 system, especially now that Nathan Vasher is out of Chicago. 1 (con’t) – Falcons (added S Matt Giordano) – Giordano was released by the Packers in the offseason, but he could find a home and a role with Atlanta, given the Falcons’ lack of depth in the secondary. Giordano is also an asset on special teams. 1 (con’t) – Saints (kept UFA LS Jason Kyle) – Kyle, a long-time Seahawk and Panther, got a Super Bowl ring as the Saints’ long-snapper last year. Now he gets a return engagement for another year. You don’t notice him, which is the ultimate compliment for a snapper. 1 (con’t) – Giants (added P Jy Bond) – Bond is another Australian Rules Football player trying to make the move to the NFL as a punter. He’s insurance in case the Giants can’t agree to a deal with long-time punter Jeff Feagles. A few thoughts on the Week 7 game between the Minnesota Vikings and the Pittsburgh Steelers, both from an on-field perspective and a fantasy football perspective. The Steelers took advantage of two defensive touchdowns to hand the Vikings their first loss 27-17. *Playing without CB Antoine Winfield will really hurt the Vikings. They looked really vulnerable late in last week’s game against the Ravens, and this week the Steelers were able to find some holes in the secondary, especially to rookie Mike Wallace. Winfield’s absence is especially noticeable because the depth with Benny Sapp, Karl Paymah, and rookie Asher Allen is less than ideal. *The Steelers are now a pass-first team, not a run-first team. They showed as much on a third-quarter possession where they got first-and-goal at the 8-yard line and tried two passes (along with a busted play). The next time the Steelers got an and-goal situation, Rashard Mendenhall fumbled on first down after diving to get over the 5-yard line, not the goal line. Ben Roethlisberger is having a great year, and that’s not just a benefit for the Steelers – it’s a necessity. They can’t win without him moving the ball via the air. *Mendenhall has taken over as the Steelers’ running back, and that’s not really a good thing. Mendenhall’s straight-up running style isn’t ideal for inside runs, and he’s lacking as a blocker and a receiver. He’s just not a special back. He looked good on off-tackle runs and tosses against the Vikes but not so great on inside runs. His total of 69 yards on 10 carries shows that lack of consistency. The difference between Mendenhall and an elite back like Adrian Peterson is staggering. Even the old-school Steelers combo of Fast Willie Parker and the Bus Jerome Bettis offered much more than Mendenhall can at this point. *While the Steelers are a pass-first team, the most special thing Vikings is Peterson. When he gets going, he can carry the team. Plus, he can run over guys, like he did with William Gay in the two-minute drill at the end of the game. He’s the X-factor that takes the Vikings from good to great. Brett Favre (aka Spanx) can’t carry the team, although he can help. But Favre needs to be the spice, not the entree. The fact that the Vikings threw twice on and-goal plays from the 1-yard-line in the third quarter (and had to settle for a field goal) is almost criminal. Then Favre’s fumble in the red zone in the fourth quarter led to Lamarr Woodley’s defensive touchdown. The Steelers’ second defensive TD by Keyaron Fox wasn’t Favre’s fault, but the first was. *One of the most fascinating things about the game was Favre’s propensity to look for rookie Percy Harvin on third-down plays. He targeted Harvin on at least six third-down throws in the first half, and it paid off with a 28-yard gain that sparked the Vikes’ first scoring drive. That’s a vital role for a guy with just seven games of pro experience, but it speaks to how dangerous and prepared Harvin truly is. Harvin isn’t just a dangerous kickoff returner, as he showed with his second return TD of the season, he’s also an effective receiver. *Wide receiver Bernard Berrian was a big-money signee by the Vikings just two offseasons ago, but he’s becoming less and less relevant in the offense. He had fallen behind Harvin and Sidney Rice in the receiving pecking order even before he suffered a first-half hamstring injury. The Vikings look to Berrian scheme-wise to try to get a big play out of him, and he’s capable of doing that, but they don’t appear to rely on him on conversion plays. That’s the role of a speciality player, not a stalwart. It’s not a coincidence that Rice had 11 catches for 136 yards, not to mention a touchdown that was called back, because Rice is the Vikings’ No. 1 wideout. *Vikings DT Kevin Williams might be the most underrated defensive tackle in the league. We hear a lot about DE Jared Allen, who is a force, while we lump Kevin in with Pat as the Williams wall. Pat Williams is a big run-stuffer, but Kevin Williams is more than that. He’s a penetrator inside who can also make plays in space. Don’t sleep on him. *On the other side of the ledger, it’s clear that S Troy Polamalu is what makes the Steelers’ secondary special. When he was out, Pittsburgh looked vulnerable. But with Polamalu back in there, there’s suddenly fewer holes and more danger for opposing passing games. That’s the sign of an impact player. *One young player who adds a lot to the Pittsburgh offense is rookie wideout Wallace, who had 91 total yards and a touchdown. Wallace has speed and he’s already proving to be dependable in big spots. It seems like he makes big plays every week, as he did twice in the two-minute drill at the end of the first half. He’s an outstanding third receiver for Pittsburgh. *Minnesota has two rookies playing prominent roles in Harvin and ORT Phil Loadholt, who is very appropriately named. Loadholt and Bryant McKinnie, his fellow tackle, take gigantic to another level. But the best player on the line is OLG Steve Hutchinson, whose false-start penalty in the fourth quarter was his first flag in 27 games. That’s consistency from a guy who’s also a great blocker for the run and the pass. No wonder the Vikings made him the highest-paid guard in the league. *While we don’t like Mendenhall’s running style, as long as he’s the starter he’s still a top-25 running back. He’s going to compile enough numbers to be a solid fantasy starter, but you can’t count on him to carry your team. *Roethlisberger is a top-10 fantasy quarterback, while Favre is outside of that tier. Favre threw for 334 yards in this game, but that total was padded by two late drives in comeback mode. Meanwhile, Roethlisberger’s solid day was probably about as bad a fantasy day as he can have, and if that’s the case he’s a solid starter. *What we’re seeing about Berrian’s role should be a big red flag to fantasy owners, even bigger than his injury in this game. At this point, I’d take both Rice and Harvin over Berrian in fantasy leagues – and that would be the case even if Berrian were healthy. *For Pittsburgh, Hines Ward and Santonio Holmes remain above Wallace in the fantasy pecking order, but Wallace is a top-40 wideout going forward. He’s a nice sleeper play, especially against a bad passing D or a defense who is missing a major player like the Vikings’ was. Ward didn’t have a big game in this one, while Holmes had 59 yards. *We raved about TEs Heath Miller of Pittsburgh and Visanthe Shiancoe of Minnesota in this post last week. Even though neither had a huge game in this one, we stick by our recommendations of both to fantasy owners. Another week, and a bunch more moves on the NFL landscape. Here’s a review of the moves from March 14-20 in comparison to each other. The 10 level is reserved for the team that made the most important signings of the week; the 1 level is reserved for a team that’s merely worth mentioning this week. Click on the following links for comparisons of the opening weekend, week 1, and week 2 moves. 10 – Saints (add S Darren Sharper, DE Paul Spicer and C Nick Leckey; kept WR-RS Courtney Roby) – The Saints still have major secondary needs, so Sharper’s leadership and veteran wiles are vital. He’s the NFL’s active leader in interceptions with 54. Spicer, who spent 10 years with the Jaguars, still can be a spot pass rusher and is worth a 1-year deal. Leckey started 10 games in Arizona last year and can fit in on the line. Roby fits in as a return option for New Orleans. 9 – Browns (add OT John St. Clair, LB Eric Barton, OG Floyd Womack, CB Corey Ivy, and RB Noah Herron) – St. Clair is a former first-round bust in St. Louis who emerged as a decent right tackle in Chicago. He got a deal worth $9 million over three years to be the bookend to stud OLT Joe Thomas. Barton has lost not just one but a few steps, but he knows Eric Mangini’s defense and may still be able to play at least on running downs. Womack, who has one of the league’s greatest nicknames — Pork Chop — played both guard and tackle in his nine years in Seattle. He’s an ideal 6th lineman who can also start and do OK. Ivy was Baltimore’s nickel back last year, and he played well in that role. He should fill a similar role in Cleveland. 8 – Ravens (add TE L.J. Smith and CB-RS Chris Carr) – Smith had a bad year in Philadelphia in ’08, largely because of injury, but he’s a dangerous pass catcher when healthy. The Ravens hope having either Todd Heap or Smith healthy will give them a middle-of-the-field threat. At $1.5 million for one year, Smith is kind of a pricy insurance policy. Carr is an underrated player who really emerged in Tennessee last year. He’s a dynamic returner, and he proved he could also contribute as a nickel back for the Titans. Given the overhaul the Ravens are doing at cornerback, Carr could be a very important player for them. He looks to fit in behind Dominique Foxworth (another addition) and Fabian Washington as Baltimore’s No. 3 corner. 7 – Patriots (add WR Joey Galloway and OL Al Johnson; kept DE Mike Wright, OT Wesley Britt and S Tank Williams) – Galloway was ineffective last year because of injury, but he was quietly dangerous in Tampa Bay in the two seasons before that. He’s a veteran who could fit in beautifully as an outside receiver opposite Randy Moss and beside Wes Welker, but Galloway will have to beat out Greg Lewis for that spot. In any case, the Patriots have improved their depth at receiver. Johnson is an interior lineman who was in Miami last year. Wright is a rotation defensive end who got a 4-year, $7.2 million deal to remain in New England. 6 – Raiders (add OT Khalif Barnes; kept C Chris Morris) – Barnes only got a one-year deal to move to the bay from Jacksonville, which is why this move isn’t higher. But he’s a talented player who is still trying to prove he can be an elite left tackle in the NFL. He’ll be a certain starter in Oakland. 5 – Cardinals (add RB Jason Wright, NT Rodney Leslie, TE Anthony Becht, and C Donovan Raiola; kept OLB Clark Haggans, DE Bertrand Berry and OG Elton Brown) – Wright, who got 2 years and $2 million on his new deal, replaces J.J. Arrington as Arizona’s third-down back. That’s the proper role for him. Leslie is a wide load who can play nose tackle as the Cards move to a 3-4 defense. He probably should be a backup and not a starter, but he’s a good option to have around. Becht is a block-first tight end who provides insurance in case Stephen Spach can’t return from his playoff knee injury. Haggans and Berry got one-year deals to stick around. Berry is a good citizen and team leader who can still get to the passer on occasion. Haggans played in Pittsburgh for eight years and should be an asset as the Cardinals seek to move to a 3-4 defense modeled after the Steelers’ D. Brown has started in the past but is more of a backup type. 5 (con’t) – Buccaneers (add LB Angelo Crowell) – Crowell missed the entire ’08 season with injury but was a productive linebacker in Buffalo before then. He’s vital in helping the Bucs replace ousted outside ‘backers Derrick Brooks and Cato June. 5 (con’t) – Chiefs (add LB Monty Beisel and WRs Bobby Engram and Terrance Copper) – Engram fits in as a possession receiver across from Dwayne Bowe, who is emerging as a quality No. 1 receiver. Engram didn’t do much last year because of injury, but he had a great ’07 season. Copper, meanwhile, will probably fit in more on special teams than on offense. Beisel will help new defensive coordinator Clancy Pendergast install his new offense. Beisel was a Chief from ’01 to ’04 but spent last season in Arizona with Pendergast and new head coach Todd Haley. This is another offseason move dedicated to getting a veteran hand who can help install and teach a new system. 4 – Redskins (add DE Renaldo Wynn; kept PK Shaun Suisham) – Wynn, a Redskin from ’02 to ’06, returns from the Giants on a one-year deal to provide defensive line depth. 3 – Titans (add WR-RS Mark Jones) – Jones moves from Carolina to replace Chris Carr as Tennessee’s primary returner. Jones brought more juice to the Panthers’ return game last year than Carolina had seen since Steve Smith was in that role, so he’ll help in Tennessee. 3 (con’t) – Eagles (add FB Leonard Weaver) – Weaver is the prototypical West Coast offense fullback. He can block pretty well, catch the ball a little, and run short-yardage plays in a pinch. He was actually on the field for more than 50 percent of Seattle’s offensive snaps last year, but with Mike Holmgren retiring, the offense was going to change enough to limit Weaver’s touches. He’ll step in and be a solid complement to Brian Westbrook in Philly, and he’ll make a play or two along the way as well. Weaver is a role player well worth a 1-year, $1.75 million deal. 2- Vikings (add CB Karl Paymah and WR-RS Glenn Holt) – Paymah moves from Denver on a one-year, $1.55 million deal to contribute as a backup corner and a special-teams dynamo. Holt will help on special teams too; he’s a quality returner who will keep the Vikings from having to use Bernard Berrian in that position. 2 (con’t) – Jets (add Marques Douglas; kept S Abram Elam and CB Ahmad Carroll) – Douglas is another ex-Raven who can play defensive end in new head coach Rex Ryan’s system. He’ll be a backup who plays in a rotation. The Jets kept Elam by matching a 1-year, $1.5 million offer sheet he had signed with Cleveland. Elam can backup both safety spots, and he played well last year. Carroll is a former first-round pick who might have finally found a home after latching on with the Jets last year. 1 – Bills (add LB Pat Thomas) – With Angelo Crowell leaving, the Bills needed to add a veteran linebacker who could start. Thomas opened nine games last year in Kansas City, so he fits that bill. 1 (con’t) – Packers (kept CB Jarrett Bush and DE Mike Montgomery) – The Packers matched an offer sheet from the Titans to keep Bush, but it’s strange to picture them paying $4.5 million over three years for a backup corner. Bush will need to at least be a nickel back for this contract to make sense for Green Bay. Montgomery was a backup defensive tackle last year, but he’ll likely become an end in the Packers’ new 3-4 scheme. 1 (con’t) – Broncos (add OG Scott Young; kept TE Jeb Putzier) – Young was a backup with Philadelphia and should fill a similar role in Denver. Putzier could be an important retention because the Broncos are shopping pass-catching TE Tony Scheffler. Putzier can catch OK but is more of a blocker, which will be more important in the new offense that rookie head coach Josh McDaniels is installing. 1 (con’t) Lions (add TE Will Heller) – Heller’s a block-first tight end who will help the running game but won’t catch much at all. He comes from Seattle to replace John Owens, who went from Detroit to Seattle. 1 (con’t) – Steelers (kept OG Trai Essex, CB Fernando Bryant and LB Arnold Harrison) – Bryant is an established vet who didn’t play much after signing in Pittsburgh in the middle of last season. The hope is that, with training camp under his belt, he can serve as an effective backup. Essex signed a two-year deal, which is important because so many Steelers linemen are still free agents.